Former Amazon exec Julie Benezet discusses her new book on the benefits that can come from being uncomfortable. Knowledge@Wharton: How did your experience at Amazon shape the content of this book? Knowledge@Wharton: That’s an issue that a lot of executives have — they want to have the security of the known, and they do have the fear of the unknown. Knowledge@Wharton: How has digital affected our ability to deal with the unknown in both our professional and personal lives? Knowledge@Wharton: Early in the book, you write about these first couple of experiences of building fulfillment centers. You had to develop one in Germany, which was a unique dynamic in trying to understand the customer there, compared with the American customer. Can you tell us about that? Amazon at the time was hardly creditworthy. We were beloved by Wall Street because our stock soared because people saw this great future, but the lenders weren’t so convinced. They said, “You have no credit. You’re not profitable. In fact, you stubbornly say you don’t want to make profits for the next few years” — which was not a very strong base to go in from. When you arrive at the doors of landlords who have never met you, who say, “Yeah, we hear about in the United States, you got this thing going. But we don’t know about it here. We have requirements.” It took a lot of painting a picture of, “Here is the acceleration of the internet, which is growing at 2,300% a year. Here is the acceleration of people buying off catalogs. You put these things together, you have a business model that is only going to grow; it’s going to grow quickly. That’s why we have to get this super-sized facility to house all of this.” They finally believed it, and we were able to get a distribution center. But there was a lot of insanity along the way when people, just because of the scariness and the speed of it, pushed back. Believe it or not, that made a big difference. About 50% of the retail activity on Amazon now occurs in the Marketplace format, but it started with a failure. Back in ’98, ’99, when we were trying to get this distribution center in Germany, we were awash in failures. But it led to something that was successful, and we got the distribution center. Knowledge@Wharton: You have four key principles that you call the Core Four. What are they? Knowledge@Wharton: How much do you think leadership is truly going into the unknown? THE FIRST great surge of foreign interest in Africa, dubbed the “scramble”, was when 19th-century European colonists carved up the continent and seized Africans’ land. The second was during the cold war, when East and West vied for the allegiance of newly independent African states; the Soviet Union backed Marxist tyrants while America propped up despots who claimed to believe in capitalism. A third surge, now under way, is more benign. 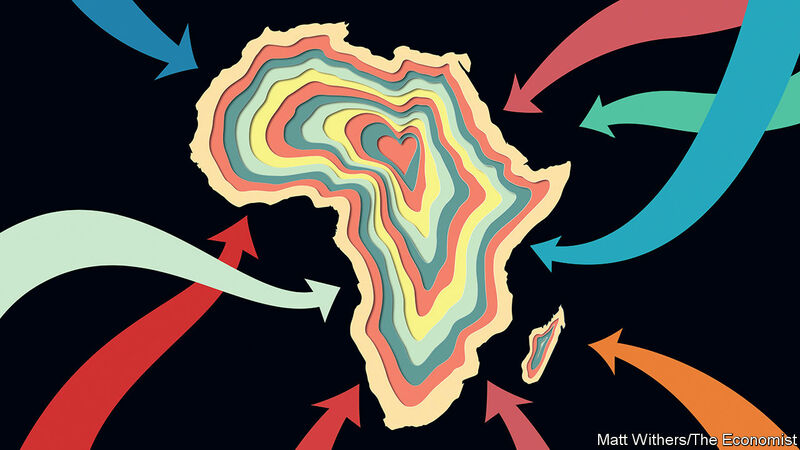 Outsiders have noticed that the continent is important and becoming more so, not least because of its growing share of the global population (by 2025 the UN predicts that there will be more Africans than Chinese people). Governments and businesses from all around the world are rushing to strengthen diplomatic, strategic and commercial ties. This creates vast opportunities. If Africa handles the new scramble wisely, the main winners will be Africans themselves. The extent of foreign engagement is unprecedented. Start with diplomacy. From 2010 to 2016 more than 320 embassies were opened in Africa, probably the biggest embassy-building boom anywhere, ever. Turkey alone opened 26. Last year India announced it would open 18. Military ties are deepening, too. America and France are lending muscle and technology to the struggle against jihadism in the Sahel. China is now the biggest arms seller to sub-Saharan Africa and has defence-technology ties with 45 countries. Russia has signed 19 military deals with African states since 2014. Oil-rich Arab states are building bases on the Horn of Africa and hiring African mercenaries. Commercial ties are being upended. As recently as 2006 Africa’s three biggest trading partners were America, China and France, in that order. By 2018 it was China first, India second and America third (France was seventh). Over the same period Africa’s trade has more than trebled with Turkey and Indonesia, and more than quadrupled with Russia. Trade with the European Union has grown by a more modest 41%. The biggest sources of foreign direct investment are still firms from America, Britain and France, but Chinese ones, including state-backed outfits, are catching up, and investors from India and Singapore are eager to join the fray. The stereotype of foreigners in Africa is of neocolonial exploiters, interested only in the continent’s natural resources, not its people, and ready to bribe local bigwigs in shady deals that do nothing for ordinary Africans. The stereotype is sometimes true. Far too many oil and mineral ventures are dirty. Corrupt African leaders, of whom there is still an abundance, can always find foreign enablers to launder the loot. And contracts with firms from countries that care little for transparency, such as China and Russia, are often murky. Three Russian journalists were murdered last year while investigating a Kremlin-linked mercenary outfit that reportedly protects the president of the war-torn Central African Republic and enables diamond-mining there. Understandably, many saw a whiff of old-fashioned imperialism. However, engagement with the outside world has mostly been positive for Africans. Foreigners build ports, sell insurance and bring mobile-phone technology. Chinese factories hum in Ethiopia and Rwanda. Turkish Airlines flies to more than 50 African cities. Greater openness to trade and investment is one reason why GDP per head south of the Sahara is two-fifths higher than it was in 2000. (Sounder macroeconomic policies and fewer wars also helped.) Africans can benefit when foreigners buy everything from textiles to holidays and digital services. Even so, Africans can do more to increase their share of the benefits. First, voters and activists can insist on transparency. It is heartening that South Africa is investigating the allegedly crooked deals struck under the previous president, Jacob Zuma, but alarming that even worse behaviour in the Democratic Republic of Congo has gone unprobed, and that the terms of Chinese loans to some dangerously indebted African governments are secret. To be sure that a public deal is good for ordinary folk as well as big men, voters have to know what is in it. Journalists, such as the Kenyans who exposed scandals over a Chinese railway project, have a big role to play. Second, Africa’s leaders need to think more strategically. Africa may be nearly as populous as China, but it comprises 54 countries, not one. African governments could strike better deals if they showed more unity. No one expects a heterogeneous continent that includes both anarchic battle zones and prosperous democracies to be as integrated as Europe. But it can surely do better than letting China negotiate with each country individually, behind closed doors. The power imbalance between, say, China and Uganda is huge. It could be reduced somewhat with a free-trade area or if African regional blocs clubbed together. After all, the benefits of infrastructure projects spill across borders. Last, Africans should take what some of their new friends tell them with a pinch of salt. China argues that democracy is a Western idea; development requires a firm hand. This message no doubt appeals to African strongmen, but it is bunk. A study by Takaaki Masaki of the World Bank and Nicolas van de Walle of Cornell University found that African countries grow faster if they are more democratic. The good news is that, as education improves and Africans move rapidly to the cities, they are growing more critical of their rulers, and less frightened to say so. In 1997, 70% of African ruling parties won more than 60% of the vote, partly by getting rural chiefs to cow villagers into backing them. By 2015 only 50% did. As politics grows more competitive, voters’ clout will grow. And they will be able to insist on a form of globalisation that works for Africans and foreigners alike. The first step is to acknowledge that the regime not only partners with drug cartels but also with guerrilla groups deemed terrorist organizations. Dissident members of the Revolutionary Armed Forces of Colombia (FARC) group – those who did not participate in the peace accord or have since dropped out – hide in Venezuela. The National Liberation Army – responsible for bombings of oil infrastructure and civilian targets in Colombia – guards the illegal gold mining operations in Venezuela which help prop up Maduro and his collaborators. Venezuela’s regime is not a terrorist state but it harbors and works with groups that have been designated as such. Infiltrating chavismo to help identify its big illegal dealings and the practices of its leaders is the type of thing narcotics agents do to successfully dismantle cartels. This is not without risk because chavismo’s counterintelligence apparatus, advised by Cuban officials, constantly monitors dissenters inside and outside the regime. But it is not impossible. The Drug Enforcement Administration already successfully infiltrated the cocaine smuggling plans of Maduro’s nephews, which served to put them away. But when infiltration is too risky, paying informants to confess and to turn on the top capo is another tried and true police strategy. There are a number of chavistas who would be willing to give information on the regime’s inner workings in exchange for being allowed to keep their ill-gotten gains, or for assurances they won’t be prosecuted in the future. Cutting off the money flow of both legal and illegal cash that helps the regime survive is paramount. For Venezuela that will mean continuing to tighten sanctions as well as finding ways to track and seize shipments of illegally mined gold. Of course wresting control of Citgo from the regime has hurt Maduro, and having bond holders to go after government assets would further undermine the regime’s financial strength. Every educated person should have read the classics by Jules Verne, Robert Heinlein, Isaac Asimov, and Arthur C. Clarke, among others. Add Neal Stephenson to that list. I’ve been a fan of Stephenson’s novel The Diamond Age since it was published in 1995. I strongly recommend you read the book. But one theme in the book is quite a breakthrough, and spot-on. It posits the creation of “phyles” as the major form of social and political organization. The word comes from the same root as phylum, from the Greek, meaning “tribe” or “clan.” But I think it’s also a pun on the word “filial,” with its connotations of family. The book posits, I believe correctly, that in the near future most nation states will have broken down. Many will have ceased to exist. It’s quite logical, because they’re a dysfunctional way for people to organize. And it’s happening right before our eyes. None of the countries in the Middle East, Africa, or Central Asia have any coherence. They’re just the result of some ruler’s military prowess, or some politicians drawing lines on a distant map. Nation states themselves have really only been around since the 17th century. Before that, people weren’t loyal to a country; they were loyal to a chief, a king, or an emperor. Loyalty to a country can make some sense, on at least a primitive atavistic level, as long as the inhabitants of the “country” share a common language, religion, ethnicity, and customs. But it makes no sense when they have little in common. So it’s natural, and salubrious, for the various religious, ethnic, racial, cultural, or economic groups within a country that’s become too big, too “diverse,” and too “inclusive,” to want to get out. Everyone recognizes – even if they don’t say it – that a national government is just a vehicle for theft, benefiting the group that controls it. As the world becomes more educated, the average man becomes more acutely aware of that fact. And as jet travel and the internet become universal, people start to realize they might have almost nothing in common with their so-called “countrymen.” And a lot more in common with people who may be on the other side of the globe, many of whom will feel the same way about their own countrymen. In any event, almost all the world’s nation states are terminally burdened with debt, taxes, regulations and increasingly, strife between groups fighting for either a teat on the milk cow or political power. The nation state is a dinosaur; it no longer makes sense in a world with today’s technology and demographics. This explains what we’ve seen in the last generation: the breakup of states. The USSR into 15 components. Yugoslavia into six. Czechoslovakia into two. Sudan into two. This is just the opening round. Most European countries have secessionist movements. Russia should eventually break up into a dozen new states. China into at least a half-dozen. Brazil into at least two. Bolivia into at least two, etc., etc. In fact, a country with a big military stationed all over the world, not only can’t defend its citizens, but actually draws in attacks by making enemies among the natives in far off places. In the past, it didn’t matter – the natives were immobile and powerless. Today they can go anywhere and access a wide variety of weapons. In fact, governments are so united against “terrorism” because it’s not just a very effective tactic against the nation state – it really can only be used against the nation state. Governments couldn’t care less about the few hundreds of people that might be killed in a terror attack. They care because it threatens their existence. The safest way to avoid attack in the age of cheap and easily available atomic, biological, and chemical weapons is to be dispersed. At least not to be part of a geographic nation state. From a military point of view a nation is about as viable as cavalry before WW1 or battleships during WW2. Not being part of a nation state ameliorates a lot of problems for a person, but it’s not a total solution. What The Diamond Age posits, and I think is going to happen, is that people will form phyles, joining in an alliance according to what’s most important to them. Or the way they “self-identify,” to use a currently fashionable term. Jews famously stick together relative to the goyim. That’s one reason at least part of Israel (likely excluding the Hasidim and Palestinians) will survive as a nation. One reason Mormons are so successful is that they favor each other, like the Jews. Muslims (although rarely economically successful, for other cultural reasons) definitely do the same. Birds of a feather (all the outraged hysteria about racism notwithstanding) do, in fact, tend to flock together. So here’s my prediction of what’s going to happen over the next couple of generations. Many nation states will simply collapse or disappear. Incidentally, I don’t think the U.S. will be a survivor. The country used to share a common culture, albeit with quaint regional variations. That’s no longer the case. The election of Trump has crystalized long-simmering, and growing antagonisms. It’s not that Americans just have a political difference of opinion. It now boils down to mutual cultural hatred, and on a visceral level. It’s only been exacerbated by the push for “multiculturalism,” always a stupid and destructive concept, from the usual suspects. So what will happen? Everywhere people will reorganize for mutual support, defense, insurance, companionship, and everything else. But it won’t have much to do with politics as we now know it. The timing of the new year holiday had a big impact on China’s February trade data. The broader picture still isn’t very encouraging. This time of year, the Chinese economy resembles a poorly kept barnyard. Dogs, pigs and even dragons run roughshod over the data. 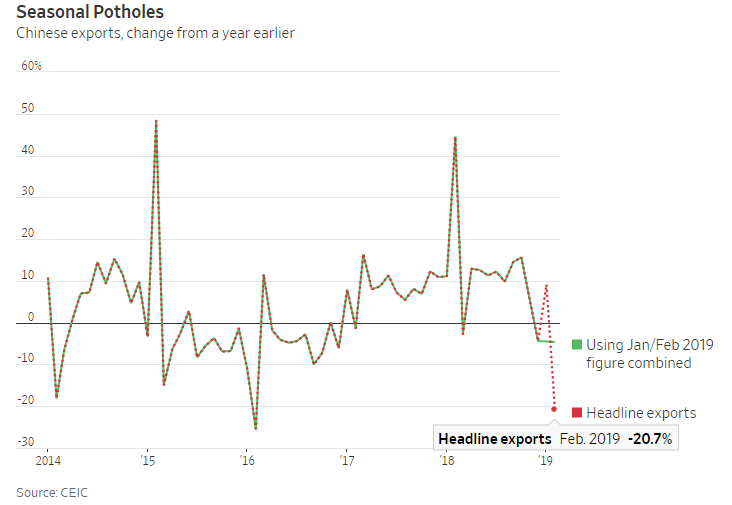 China’s apparently frightening drop in exports in February—down 20.7% on the year—is a classic example. Western countries follow the Gregorian calendar, but China’s most important holiday follows the lunar calendar. In turn, the shifting weeklong Lunar New Year holiday makes year-over-year comparisons of economic data in January, February and sometimes even March tricky. In 2018, the Year of the Dog, the holiday fell on Feb. 16, the second-latest Lunar New Year in the past decade. That meant more of the distortion in early-year trade data was pushed into March: February exports in 2018 rose 44.5% from a year earlier, but March exports fell 2.7%. This year, the holiday came on Feb. 5, meaning most of the impact was in January and February. That huge base effect from last February largely explains the stomach-wrenching drop this year. None of this is to say Chinese exports are doing well, it’s just the magnitude of the drop that is off. The combined January and February data give a more-accurate picture. Exports in the first two months of 2019 were 4.6% lower than a year earlier, similar to December’s pace of 4.4%. Weakening growth in Europe is one factor: January-February exports in yuan terms were up 7.5% on the year, significantly slower than double-digit growth rates in mid-2018. But the trade conflict with the U.S. is now really starting to bite. January-February exports to the U.S. fell 9.9% in yuan terms. Exports to Southeast Asia, however, rose 7%—implying some rearrangement of supply chains to avoid U.S. tariffs, suggests ANZ. Chinese stocks opened down sharply lower following dreary news overnight from Europe, and dropped further after the trade data released midmorning. 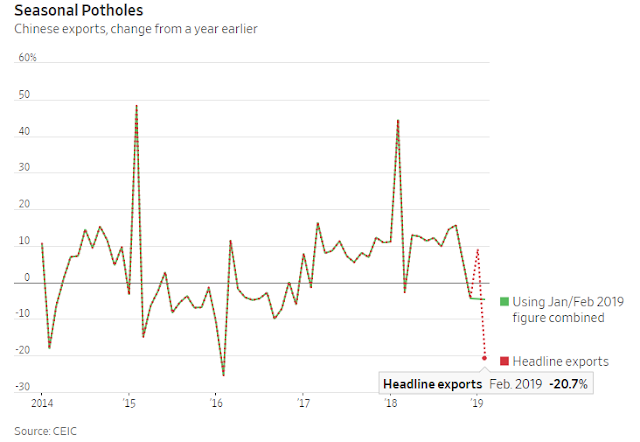 The overall picture is of China starting to feel real heat from U.S. trade pressure—but not in utter collapse as the headline figure implies. Still, things will likely get worse before they get better: China’s manufacturing purchasing managers index still shows new export orders trending down. In 2018, Chinese exports proved resilient. The real dog days, unfortunately, are still ahead.